The European Commission and 180 companies and research organisations (under the umbrella of euRobotics) today launch the world’s largest civilian research and innovation programme in robotics. Covering manufacturing, agriculture, health, transport, civil security and households, the initiative – called SPARC – is the EU’s industrial policy effort to strengthen Europe’s position in the global robotics market (€60 billion a year by 2020). This initiative is expected to create over 240,000 jobs in Europe, and increase Europe’s share of the global market to 42% (a boost of €4 billion per year). 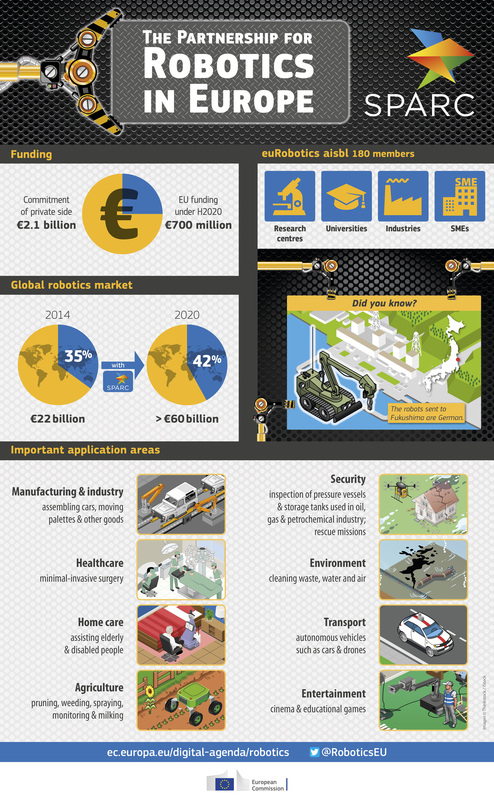 The European Commission will invest €700 million and euRobotics €2.1 billion. The University of Girona, as member of euRobotics, supports this action. ViCOROB has participated in several euRobotics meetings and is part of several projects consortiums in the current actions. We expect to succeed in H2020 as well. Such initiavtives are worth to be well known by society.